GURPS Martial Arts has a neat little (highly optional) box on minute differences between melee weapons when it comes to various combat activities, such as Stop Hits, Feints, and Fast-Draw contests. There was a question that showed up from Landwalker over on the SJG Forums about combining ‘A Matter of Inches’ (Martial Arts, p. 110) with my article on Setup Attacks from Pyramid #3/52 called Delayed Gratification. The Setup Attack replaces the Feint mechanism with a variant on an actual attack, that requires an actual defense. Let’s see what reviewing the box shows us, then. Swung weapons are slower and thus harder to successfully alter or recover from. This could be expressed as one or more of the following. The setup is easier to defend against. Your foe gets a bonus to defend against it (again, +1, but that makes it equivalent to -2 on the attack, which might be too much). The follow-on attack is harder. When you follow a Setup with a swing, you get -1 to hit. The follow-on defense is easier. +1 to defend vs. the follow-up attack, but this has the same issues as #2. I think, overall, I like #3. The setup is whatever it is, but it’s harder to reposition quickly to get the next blow in. So if you choose to follow up a Setup with a swung attack, you are at -1 to hit. This one makes me more nervous, since especially with #1, this is getting perilously close to having a penalty to skill based on weapon weight for all attacks and defenses. Now, I’m not averse to that! It makes sense in a lot of ways. But you better be prepared for the consequences, as it plays directly with character conception. If “I want to use a big sword” is suddenly nerfed because you only bought enough to barely get over the MinST and now you effectively don’t have the skill to wield it like you want, that’s going to piss people off. This speaks to Beats and parries vs. heavy weapons. The second part can apply as-is to Setups, since a Setup is an attack. For Beats . . . let me get back to that one. I don’t think this should matter in Setups. Having a longer weapon does not allow you to draw a foe out of position better, though it might be harder to reposition after said setup due to lever arm. So maybe ignore differences within weapon reach categories, but perhaps the longer weapon takes a -1 to skill on the attack or defense for each extra yard of length or something. This might only apply to swung attacks as well; spears are notoriously fast, despite being long. The question of Beats on Setups is natural and interesting. It should fall out fairly easily in the execution of the attack. Instead of launching a Setup as-is, perhaps you throw a (Deceptive) Attack at the weapon itself. So, you attack the weapon, targeting it at the usual penalties (tiny weapons are harder, longer ones easier). If you do this as a Deceptive Attack, and the penalty lowers the foe’s Parry as usual. He may attempt to pull himself completely out of reach. This is a straight-up dodge roll, including DB from shields, etc. as normal. If he succeeds, the attack misses completely. If he fails, the attack hits the weapon squarely. Treat this as a failed parry (below). Take the relative skill level of your weapon, plus any bonuses that might apply from “A matter of inches” above. Divide this by two, rounding away from zero. DB from shields, armor, or anything but the weapon does not apply (a sword enchanted somehow to provide +1 DB or +1 to Parry would still count). Since Dodge already includes Combat Reflexes, there’s no need to count it twice! Example: A ST 14 duellist with Rapier at DX+5 and Dodge-10 and a +1 due to relative ST with his weapon is being attacked by a foe trying to Beat his weapon aside. He elects to try and flick his weapon out of the way. His Relative Skill Level is adjusted up to DX+6 based on the adjustment from “A Matter of Inches,” and that is halved to +3. This boosts his “Dodge-based Parry” that is the Disengage from 10 to 13. However, his Rapier does thr+1 damage, which gives a -1 penalty, for a net of Disengage 12. If he retreats, he gains +1, giving Disengage-13. If the disengage fails, your foe strikes the weapon squarely, as with a failed true parry. If it succeeds, the Beat is avoided. Finally, he may meet force with force by utilizing his true Parry (again, DB from shields does not count). If the hit roll is successful, roll damage for the attack as usual. This damage will be applied to the weapon regardless of whether the defender’s parry is successful or not! That’s the risk the defender takes meeting the blow force-on-force (but see Sliding the Blow, below). If the parry is successful, the defender rolls swing-based damage, adding the largest bonus the weapon can have in any attack mode (a Halberd, p. B272, has three modes, and thus rolls sw+5, the highest mode). Bonuses from Weapon Master or other adds definitely count! A rapier, which usually only has a thr+1 mode, would roll sw+1 for absorbing damage in this case. Subtract this roll from the attacker’s roll. Any remaining damage applies a penalty to the foe’s Parry until the end of his next turn. Example: Our ST 14 duelist attempts to meet a naginata swing from a ST 17 foe force-on-force. The incoming blow hits the weapon, and rolls 3d+1 for 13 points of damage. The duelist succeeds in his parry, and lowers the penalty by rolling swing-based damage himself: 2d+1, and lowers it by 9! Still, the remaining damage imparts -4 to the duelist’s Parry until the end of his next turn. Additionally, the blow hits the sword, whose DR 6 lowers the incoming damage to “only” 7 points. 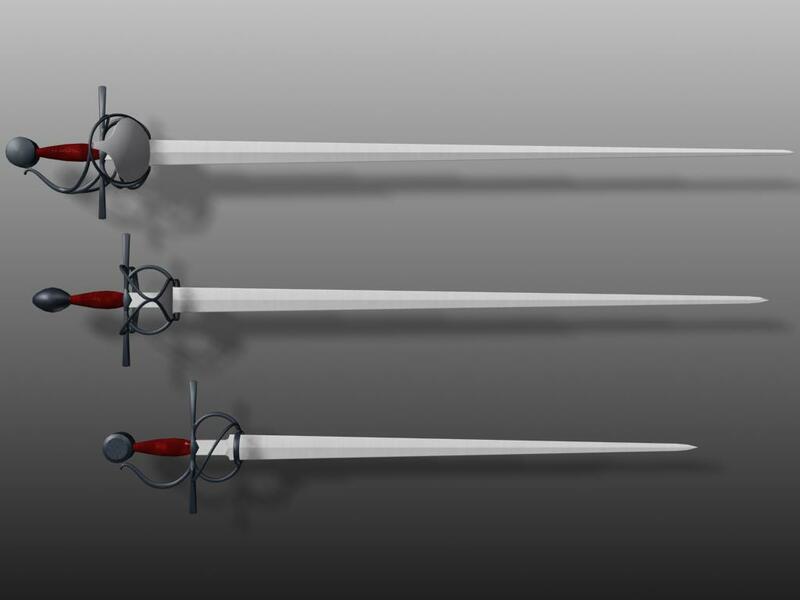 A rapier only has 11 HP, so the sword is reduced to 4 HP, which is not lower than 1/3 it’s HP . . . but it’s getting close. One more such “success” and the rapier will be useless. 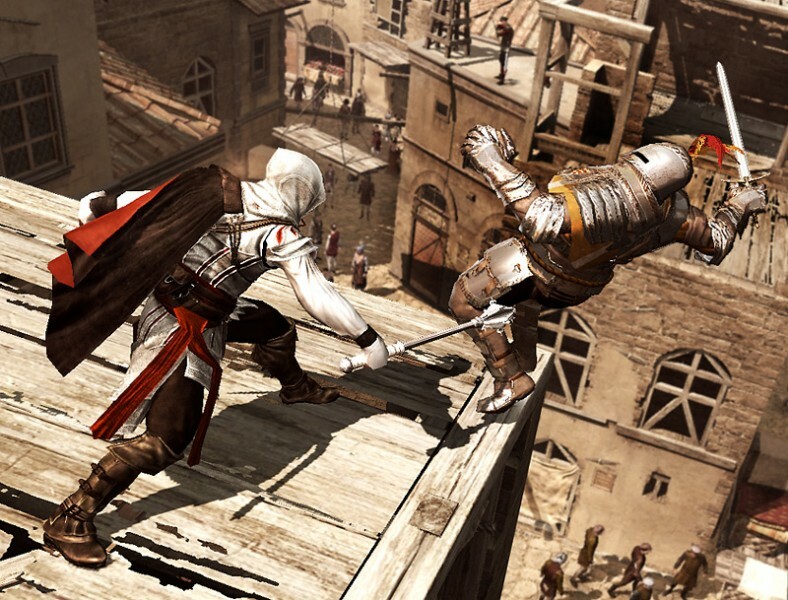 If the foe fails his parry, the attacker strikes his weapon squarely. Roll damage and apply it to the weapon normally. Also, the blow knocks the weapon out of alignment. The defender takes a -1 to Parry for every point of damage delivered until the end of his next turn. This penalty is lowered by 1 for every 2 points of ST by which the defender’s ST exceeds the MinST of his weapon (the ST Margin). If the penalty to Parry exceeds the user’s Skill/2, it is Unready. If the defender critically failed his Parry, he is disarmed. Example: Our ST 14 duelist tries again to meet another swing from the naginata. The incoming blow hits the weapon, and rolls 3d+1 for 12 points of damage. This time, the duelist fails his parry roll, and is thus at -12 to Parry. Unless our duelist has Rapier-24 or higher, his weapon is rendered Unready. Once again, the blow hits the sword, suffering 6 points of damage, lowering the HP of his poor blade from 4 HP down to -2 HP. The sword is now disabled, and a quick check on p. B485 shows that a 1d roll is called for: a roll of 2 shows that the blade breaks at the halfway mark and is now Reach 1, instead of 1,2 . . . and now only does crushing damage. 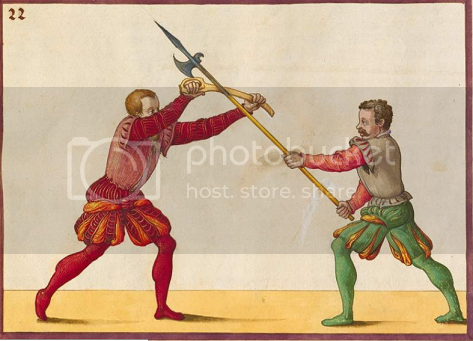 Rapiers do not parry polearms well. Very skilled wielders can partially mitigate the damage done by accepting a penalty to their Parry. For each -1 to Parry, reduce the damage inflicted by a successful blow by 1 point. This suggested tweak to the rules takes Delayed Gratification, A Matter of Inches, and the various rules for Beat, Knocking a Weapon Away, and weapon breakage and slams them all together until fusion occurs. Guess we’ll see if we have produced more energy than we used! Evaluating my own work, I think the weakest link is the disengage rule, where I wanted to have skill matter on a Dodge-type roll. That one could use some testing, and maybe tweaking. I can't thank you enough for coming up with this so I don't have to. I want to have your blog as a new, bookmarked GURPS book. Thsnks for the high praise. Some of this stuff I consider for e23 or Pyramid, but often, with things that are sequels (like the intersection of A Matter of Inches with Delayed Gratification) the overlap makes it a niche of a niche, so I just write it up and post it. Easier on everyone.